Indivigital | Will automated pay-per-second browser transactions upend the business models of Google and Facebook? A startup has devised an API (“web monetization”) that facilitates automated payments from users to publishers. It charges users a flat rate of $5 per month (46 hours of consumption per month), which is deposited to publishers at a rate of $0.00003 per second while the user is consuming content. Content on the web is largely monetized through intermediaries, or more specifically a duopoly comprising Facebook and Google. While many categorize Google as a search engine and Facebook as a social network, in practical terms both categorizations are incorrect: they could more aptly be categorized as advertising companies. In 2017, Facebook and Google generated revenue of $41 billion and $110 billion respectively. These sums were largely made possible by collecting swathes of personal and behavioral data across their freemium product ranges, which comprise browsers, content delivery networks, analytics platforms, social networks, email clients, search engines, etc., and leveraging that data to provide targeted advertising services to their clients. In Q1 of 2018, 85% of Google’s revenue was generated from providing such services. While Google crawls, indexes and queries the world’s information, Facebook does likewise for the world’s conversations. They are the 1st, 2nd and 3rd most visited websites in the world and, consequently, their business models are the web’s business model. Not only does the duopoly host the world’s news and video content, their technical or policy changes or decisions can shutter businesses and precipitate wholescale changes to the infrastructure of the web. Such is the predominance of Google and Facebook many publishers and authors, from academics to journalists and videographers to photographers, are wholly reliant on their services to monetize their works. In other words, Facebook and Google aren’t as much part of the web’s ecosystem as they are the web’s ecosystem, and some believe it’s this ecosystem that Coil, a startup founded by former Ripple CTO Stefan Thomas, could upend. Coil, as it’s envisaged, will facilitate instantaneous, browser-based payments to creators (e.g. publishers, authors, etc.). Coil users interested in consuming content from Coil creators pay a flat rate of $5 per month to consume creators’ works. When a user consumes content from a Coil creator, the user’s browser will automatically transfer payment to the creator, with the value of the transfer dependent on the amount of time the user spends consuming the creator’s work. If a user consumes less than $5 of content from a Coil creator in any given month then Coil will make a profit; if they spend more, Coil will plug the shortfall (we’ve provided more data on this below). What’s the upside for users? It’s believed that Coil-enabled services will begin offering perks to Coil users, with the most frequently touted perk being an “ad free” experience. However, these perks could extend to anything, including the provision of self-hosted video content, as well as the disabling of social sharing buttons or any other requested script that sends behavioural data back to third parties. In other words, it could pave the way for a privacy safe and distraction free browsing experience and mitigate or eliminate the trade-off many users begrudge making (i.e. sacrificing behavioural or personal data for free information or services). It could even operate as a substitute for subscription-based websites, which often rely on charging a monthly rate, or help reverse the trend towards top-down, opaque and seemingly unenforceable legislation. “[Coil is going after] the web and its business model,” said Thomas in a presentation uploaded to Youtube. “We’re giving your browser the ability to use Interledger…when you go to a website, instead of them sending you some ads you can establish an Interledger connection to that website and actually send them money while you’re viewing the page”. The flat rate arguably encourages unlimited consumption. Apple employees have even suggested Coil is like an “Amazon Prime for the internet”, while an audience member at Thomas’s presentation likened it to “the all you can eat Sushi of web monetization”. “You pay us a fixed amount per month – we don’t care how many websites you go to, how much time you spend on them, and if you spend more time we’ll pay out more, similar to how if you use more bandwidth from your internet provider they might have to pay more,” said Thomas. “We think across time and across customers it will more or less even out. [That said,] if somebody is genuinely browsing the web 24/7 and their mouse cursor moves one pixel every minute, we might block them”. According to Thomas, the flat rate fee also helps mitigate the risk posed by content farms i.e. clickbait organizations intent on prioritizing clicks ahead of substance or value. Is it good value for creators and consumers? According to Coil’s website, it pays 30 millionths of a dollar ($0.000030) per second to creators. That works out to roughly $0.0018 per minute, $0.108 per hour and $2.60 per day (24 hours). To put that in context, recent estimates suggest YouTube pays $0.0006 per view, however such a comparison is comparing apples to oranges as Coil pays based on time, not views or clicks. Overall, a user could spend roughly 46 hours per month browsing Coil enabled content before exhausting their $5 spend. On this basis, it could prove a very profitable model for Coil. Meanwhile, if a creator attracts 500 visits to their website per day, and those visits spend an average of 2 minutes consuming content, then they will receive $1.80. Over a period of one month (30 days) that works out to $54. To earn $1,500 per month with Coil a creator would have to drive roughly 14,000 visits per day or 420,000 visits per month. If the same creator were to serve advertisements rather than accept payments, and we assume 1% of people who land on a page click on an ad and the average EPC (earnings per click) is $0.25, that creator would earn $1,050. Even so, it’s not a zero-sum game. Those unwilling to pay to consume content will continue to receive advertisements, while Coil subscribers will receive an ad free experience and pay instantaneously via their browser. However, some publishers may identify an opportunity cost. While many utilize ad networks like Google AdSense, others sell inventory on a CPM basis, or directly to advertisers; what these publishers lose in ad revenue is unlikely to be recouped through Coil’s pay-per-second model. A range of well-known services are already accepting Coil payments, including Wikipedia and YouTube. 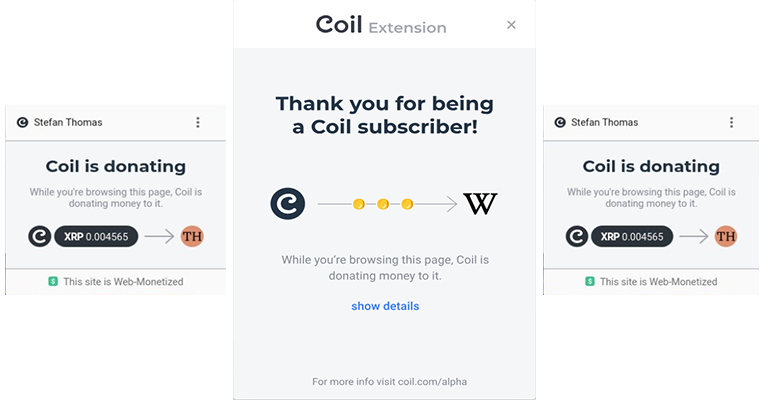 While Coil eventually aims to offer a standards compliant browser-based API (“web monetization”) to transfer funds to Coil creators, it’s currently reliant on a Chrome extension and the publisher integrating with the web monetization standard on their website to facilitate transfers. Payments are sent via the Interledger protocol, which facilitates payments in any currency, including cryptocurrencies. What could it mean for the duopoly? To articulate the potential disruption, it’s easier to consider a practical example. After visiting a page on Amazon.com you may notice advertisements relating to that product page “following” you across the web. This outcome is facilitated by a third-party provider (ad network) and a cookie set on your computer that indicates to the third party serving the advertisement that you’ve visited the page relating to the product advertised. Consequently, you’re served the relevant advertisement. Ad networks are a predominant source of income for web publishers. Google AdSense, which is one of the world’s biggest ad networks, has inventory (ad units) across millions of websites. In 2017, clicks on Google’s member property websites, which includes websites that display AdSense units, contributed $17.5 billion in revenue to Google’s parent company Alphabet. If “web monetization” becomes a primary source of income for web publishers, it could mitigate the need for publishers to host these types of networks on their websites. Of course, just because a provider accepts payments via web monetization it doesn’t necessarily mean an “ad free” experience – whether to serve ads to Coil users is a decision made by each publisher but one that’s arguably likely to be enforced. The only question that remains is: will users be willing to sacrifice $5 per month for a faster and more private web? While it seems inexpensive relative to the benefits, by this point in the web’s evolution the “free-to-user” model is entrenched in the collective mindset of internet users. Any premium service aiming to countenance that mindset must provide an accessible, affordable and universal alternative. Coil may just be that service. Is Google search biased in favor of liberals and against conservatives?